Coconut milk or "Gata" is one of the many popular ingredients used in the Philippines. 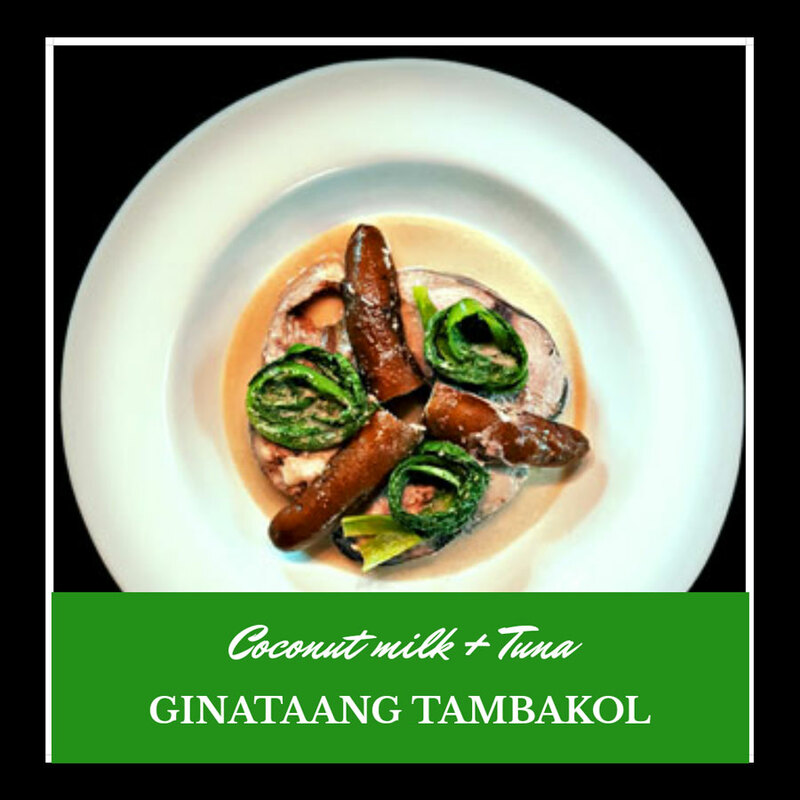 Any cooking that has coconut milk in it can be called "Ginataan", whether it's a dish like Ginataang Tambakol and Ginataang Ampalaya or desserts like Ginataang Bilo-bilo and Ginataang Halo-halo. Since coconut trees are very abundant in the Philippines, finding for its fruit is not difficult. It is available in all public markets and sometimes, even local variety stores have it. This is why locals prefer to use freshly pressed coconut milk rather than the one in the can and powdered coconut milk. 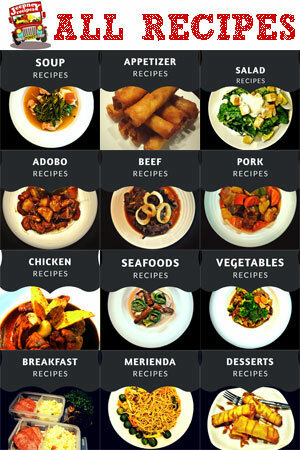 If you want to try the best "Ginataan Dishes" in the country like the very popular Bicol Express, you can find these creamy recipes in the province of Bicol the "Gata" Capital of the Philippines. Bicolanos (Locals of Bicol) really love to eat everything with coconut milk and of course chili. These people are expert in cooking Ginataan like the recipe that I'm dying to cook today, the "Ginataang Tambakol" or Tuna in Coconut milk sauce. 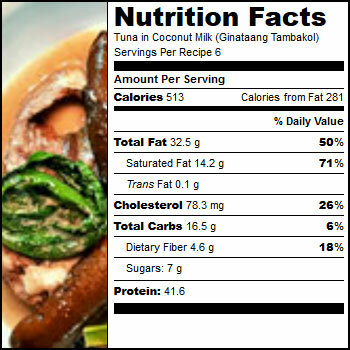 Skipjack Tuna is a rich source of protein, potassium, manganese, Vitamin B1 and B6 and essential fatty acids. It has Omega-3 and selenium, a very important anti-oxidant which helps to cleanse the body of harmful compounds, drugs and pesticides. Regular eating of tuna reduces the risk of stroke, helps maintain good memory and prevents Alzheimer’s disease, reduces depression, helps maintain normal blood pressure and fights against ovarian and digestive track cancer. Heat oil in large cooking pan. Fry eggplant until color turns slightly brown. Set aside. Fry the sliced tuna for 3 minutes each side. Set aside. Remove some oil. Saute the onion, garlic and ginger. Pour in the coconut milk then add the fried tuna. Let it simmer over medium heat for 10 minutes. Check regularly to avoid bubbling of the coconut milk. Add the fried eggplants and chinese cabbage. Simmer for another 5 minutes. Add sugar. Season with salt and pepper. Add the finger chili and turn off the fire. Cover and let the steam cook the chili. Arrange in a bowl and serve hot. Bon appetit! Coconuts are highly nutritious and rich in fibre, vitamins C, E, B1, B3, B5 and B6 and minerals including iron, selenium, sodium, calcium, magnesium and phosphorous. It's also a good substitute for milk since coco-milk is lactose free. Frying the tuna and the eggplants intensifies the taste. Add red chili to add a kick to the dish. You can use powdered seasoning to enhance the flavor.